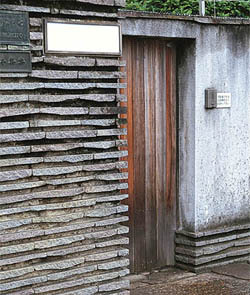 ArchitectureWeek No. 543 is now available on the Web, with these new design and building features, and more. 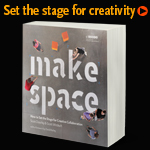 Based on the work of the Stanford University d.school and its Environments Collaborative Initiative, Make Space is packed with techniques for altering space to enhance creativity and collaboration. Highlighting details that matter the most when designing spaces to support creative teams, it's a book you'll turn to again and again. Subtitled "Dreams and Visions of Reconstruction in Postwar and Present-Day Japan," the exhibit throws up images depicting a sci-fi world of floating cities, metropolises in the sky, and soaring geometric shapes and patterns repeated over and over with little apparent corrsepondence to the psychological needs of humans. Autodesk University - "Software Everywhere"
On a chilly November morning in Las Vegas, Nevada, Carl Bass, president and CEO of Autodesk, stepped up to the stage at the Autodesk University (AU) 2011 conference to hail the emergence of a new approach in data management, powered by cloud computing. "One big idea [in collaboration] is to move from a file-based system to a data-centric approach, where the information is automatically indexed and easily searched," Bass said. "It could be overwhelming to manually manage this data by passing an individual file around. It's more about empowering access to the information you really need." "Today," he continued, "we're introducing a PLM [product life-cycle management] system that decreases complexity in managing project information. The interface is clean, is flexible. It's easy to deploy, manage, it's easy to configure." The punchline came a few minutes later, when Bass revealed, "The big news is, none of the things I just showed you are just desktop products. What I've just shown you is software running in the cloud, running on smartphones and tablets, in iOS and Android OS, on Mac. It's even running in browsers." 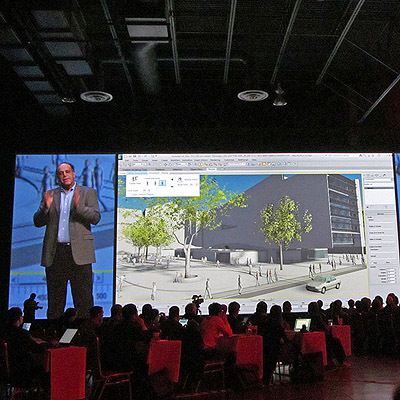 For years, Autodesk has advocated a model-based approach to building design and construction, known among practitioners as BIM (building information modeling) and IPD (integrated project delivery). The company believes the use of a single, shared digital model throughout the life cycle of a building — from initial design, simulation, and construction to maintenance — is the best way to minimize costly conflicts. But facilitating a shared workflow among architects, mechanical/ electrical/ plumbing engineers, construction crews, and owner-operators has been a challenge, to say the least. Different software used by these disciplines sometimes causes data-exchange problems. And team members' office locations, often spread out across international time zones in different regions, add to the headache. 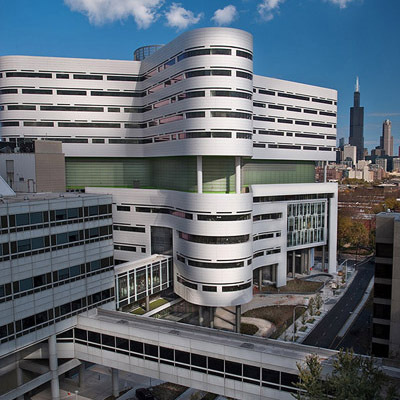 Rush University Medical Center of Chicago, Illinois, has dedicated a new hospital building designed by Perkins + Will. 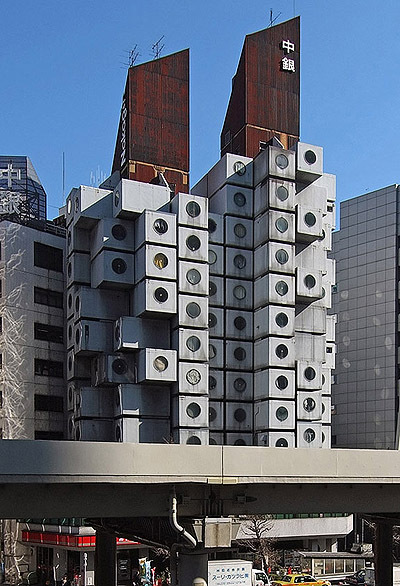 With input from doctors and nurses, and patients and their families, the architects developed a butterfly-shaped floor plan for the 14-story, $654 million new building, called the Tower. The ground floor will house the McCormick Foundation Center for Advanced Emergency Response, with 60 treatment bays and a surge capacity of 133 percent, designed to accommodate large-scale health emergencies. The tower's third floor houses an imaging center, and the three consecutive floors above that are devoted to the interventional platform, which also extends into the adjacent building. Containing 42 procedure rooms with enlarged operating rooms, this area locates diagnostic testing, surgical and interventional services, and recovery within a short distance of each other. The top floor of the building base houses women's services and neonatal intensive care, and the building's top five floors comprise the Herb Family Acute and Critical Care Tower, which contains 304 beds. Rush is seeking LEED certification for the new building, targeting a LEED Gold rating. The Tower will connect to Rush's existing main hospital building, the Atrium, via the Edward A. Brennan Entry Pavilion, a three-story reception area with circular skylights and a giant four-season terrarium. 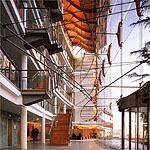 The Atrium building will be renovated following the January 9, 2012, opening of the new building. Tekla BIMsight is a free software tool for collaboration on BIM-based construction projects. Professionals in different AEC disciplines can combine their BIM models, check for clashes, markup, and share information in the same easy-to-use 3D environment. New features in Version 3.1 make it even easier to find information and communicate. 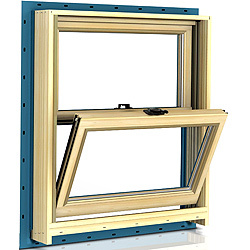 The Builders Hardware Manufacturers Association (BHMA) is offering a free download of ANSI/BHMA A156.18-2006, useful when specifying hardware on a wide range of project applications. 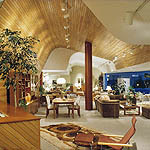 The standard establishes finish test methods and code numbers for finishes on various base materials. The Midwestern states experience the most lightning activity in the United States. A lightning flash could light a 100-watt bulb for three months. "This Dutch Colonial house can be placed very comfortably on a thirty-foot lot, and can be used on a twenty-five-foot lot without crowding. 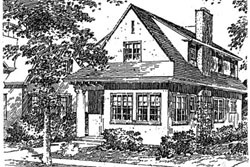 "Three features save this house from having a pinched look: First, it is built close to the ground; second, it has lawn on both sides, and third, the skillful handling of the red cement shingle roof, particularly the broad expanse over the front entrance and sun parlor.... "